The ‘Spa of the South’ is situated at an elevation of 167 mts. in the western ghat. This is a popular. Its waterfalls are known for their curative property. Its bracing climate extends particularly from June to September. Some of the excursions of Courtallam are: Tiruchendur Murugan Temple (99 km), Tirunelveli (58 km), Krishnapuram (68 km), Tenkasi (5 km) and the Mundanthural Tiger Sanctuary (75km). Air: Madurai is the nearest airport at a distance of 160 km. Rail: Tenkasi is the nearest railhead at a distance of 5 km. Road: Regular bus services are available from the town. 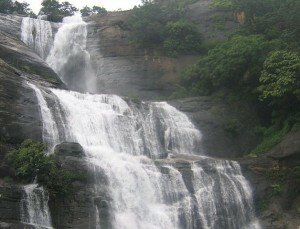 This entry was posted in Courtallam, Tamil Nadu and tagged Falls. Bookmark the permalink.